Electric Foil CE Level 1 350/600N Mask with Lame bib. Conforms to British Fencing’s new regulations for foil at Domestic Opens as well as Senior, Junior & Cadet competitions from September 2009. 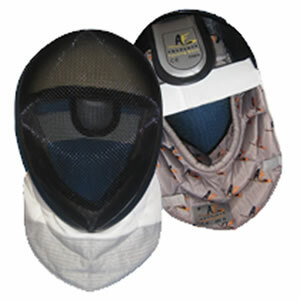 Electric Foil masks will be needed for all Size 5 electric foil fencing from September 2010 (as per BF website). This mask is outstanding value for individuals, clubs, universities and schools needing to upgrade to comply with the new regulations. Inox stainless steel lame on bib. Comfortable padded lining and bib to ensure a great fit and to withstand the more regular hits to the neck area. The best value to be found in the UK market.